Brows define the face. In fact, a good brow can make a face look great without makeup. I am totally guilty of over plucking my eyebrows. I have been doing it wrong since high school. It all started my freshman year: I got my brows waxed for the first time and I looked AMAZING! Unfortunately I thought I could keep up with the look by myself and started to tweeze the stray hairs as they grew in. BIG MISTAKE! It took me 25 years to realize that eyebrows are “sisters”, not “twins”. What do you do about it? 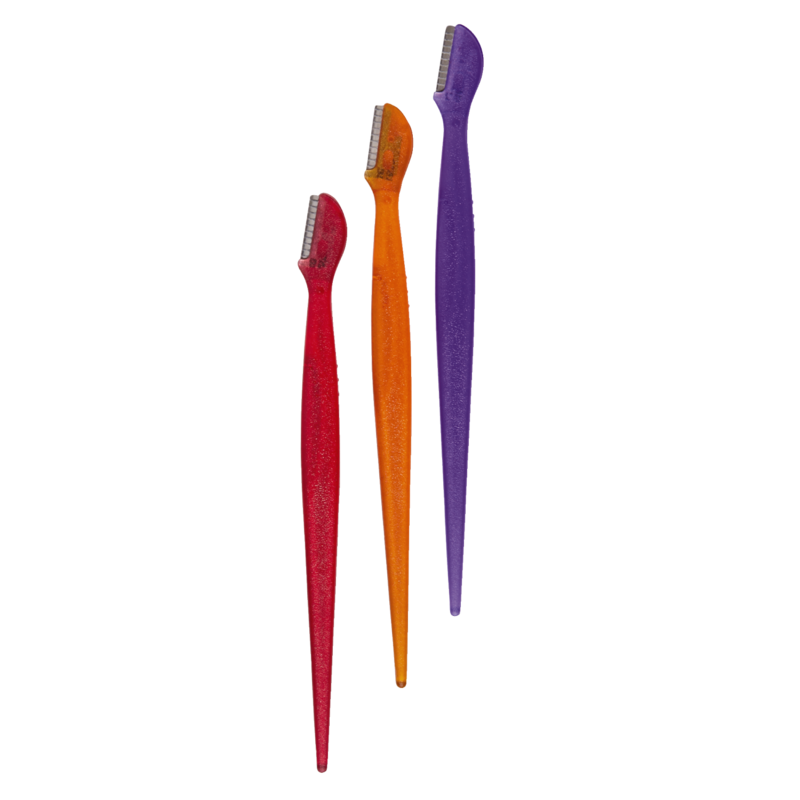 We all know that to stop tweezing those itty bitty stray hairs are easier said than done. I don’t know anyone that can stand the feeling of that one hair out of place. Personal restraint from pulling that little hair screaming at you is like dieting during the holidays. It’s torture. STOP TWEEZING! At all cost. Don’t do it. This is your intervention. Use a safety razor meant for small areas on the face (see picture). This is the holy grail of growing out your eyebrows! Use the razor to closely cut the little stubbly hairs that are desperately trying to gain real estate on your brows. Be gentle, go slow. Wet the area you intend to shave with water and a little facial lotion. You don’t want to give yourself razor burn. Be careful not to accidentally shave the hairs that are already long and happily living in the right place. With this technique you will have smooth skin with no visible stubble for nearly 24 hours. YOU CAN DO THIS EVERY DAY until you have populated enough hairs in your little eyebrow farm. long enough to fill in with a eyebrow pencil and powder. I promise, you will feel human again. With an angled brush, use a brow powder to create the shape and an eyebrow pencil to build wax on the hairs that create volume. Brush the hairs and use an eyebrow gel to hold the brows in place. I love Anastasia brow gel. It’s very sticky yet doesn’t coagulate like glue. At $22.00 it’s worth every penny, I promise. The most important thing is to remain patient as your hairs grow out. They will grow out weird, but will eventually straighten themselves out. If you must remove the hairs that seem to grow on your eyelids, go ahead, pluck away. For the fine and fuzzy hairs that come in LEAVE THEM BE! If you must shape your brows use your safety razor. At least your eyebrows will still be there and you won’t be consistently damaging each of your hair follicles. And while they are goofy, you can at least count on brow gels and makeup to support your endeavor until they grow out in the correct direction. Expect your hairs to be back to their fullness and normal shape within a year. Then find yourself a proper eyebrow artist to maintain a crisp shape because you probably cannot be trusted to be your own “hair maintenance manager” from now on! Good luck!